The Avure Quintus Hot Isostatic Press (HIP) will expand Alcoa Howmet’s production capabilities for investment-cast and 3D-printed parts made from Ni-based superalloys and titanium alloys. (Photo courtesyof Avure Technologies). 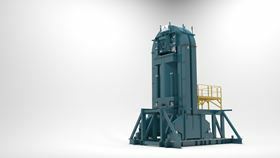 Avure Technologies reports that it will supply a Quintus hot isostatic press (HIP) to Alcoa Howmet, a maker of components for the jet aircraft, gas turbine, and other industries. Avure says that its HIP systems can produce parts with improved isotropic material properties, offering the highest possible density of all available compaction methods. The model QIH286 HIP to be installed at Alcoa Howmet will be equipped with the company’s patented uniform rapid cooling (URC) technology, enabling increased productivity with improved temperature control. The press operates at a pressure of 2000 bar (29,000 psi) and a temperature of 1250°C (2282°F). It has a work zone of 1.6 m (5.25 ft) in diameter and 2.6 m (8.5 f) in height. Alcoa Howmet’s new press is also reportedly the largest diameter HIP operating at 2000 bar to be deployed in the United States. This story is reprinted from material from Avure, with editorial changes made by Materials Today. The views expressed in this article do not necessarily represent those of Elsevier.